A salivary gland tumor or parotid tumor is cancer beginning in one of your salivary glands. It's not just a single disease. You actually have various salivary glands near and inside your mouth. Many types of-cancerous (benign) tumors and cancer can develop in these salivary glands. Salivary gland cancers aren't that common and make up less than one percent of cancers in the U.S. Each year around one in 100,000 individuals in the U.S. develop this cancer. Parotid (salivary gland) tumors occur in individuals of just about any age, however, they become more common as individuals become older. Sixty-four is the average age diagnoses are made. Overall, around 72 percent of individuals who receive a salivary gland cancer diagnosis are still alive a minimum of five years after being diagnosed, including individuals with all stages and types of the cancer. There are hundreds of salivary glands around and in your mouth. Some of these glands are so small, you need a microscope to see them. 1. The parotid glands. These are located right in front of your ears and are your largest salivary glands. Around seven out of 10 salivary gland tumors develop here. Most are benign, but most malignant (cancerous) tumors start at the parotid glands. 2. The sublingual glands. These are the smallest and are located under the floor of your mouth below either side of your tongue. It's rare to have tumors start in these glands. 3. The submandibular glands. These are under your jaw and are smaller. They produce saliva underneath your tongue. Around one to two out of 10 tumors begin in these glands and around half are cancerous. You also have many tiny salivary glands inside your cheeks, in your lips and throughout your throat and mouth. What Do Salivary Glands Do? These glands make saliva. This is a fluid that lubricates your throat and mouth. Your saliva contains enzymes that start the food digestion process. There are also antibodies in your saliva and other substances that help prevent mouth and throat infections. 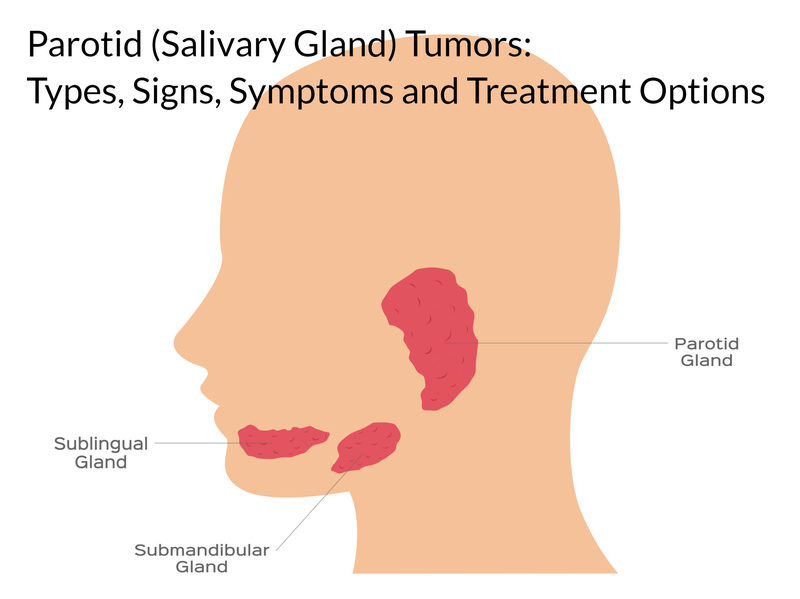 What are Salivary Gland (parotid) Tumors Types? These are the most common salivary gland cancer type. Most of them begin in the parotid glands and don’t develop as often in minor salivary glands in your mouth or in the submandibular glands. While they can be an intermediate grade or high grade, they're typically low grade. This is often slow growing and is low-grade. But, it's still extremely difficult to eliminate it completely since it often spreads along nerves. Also, these often come back following treatment (generally radiation and surgery), in some cases many years later. Patients' prognosis is better for small tumors. This is a term doctors use for describing cancers that begin in gland cells (these are cells that usually secrete some type of substance). There are various types of adenocarcinomas. Acinic cell carcinoma: Many of these begin in the parotid gland. They're usually slow growing and often develop at a younger age than many other types of salivary gland cancers. They're typically low grade, but predicting a patient's outlook is better determined by how far they've grown into neighboring tissue. Polymorphous low-grade adenocarcinoma (PLGA): PLGA tumors often begin in the minor salivary glands. PLGA tumors often grow slowly and can usually be cured. Adenocarcinoma, not otherwise specified (NOS): NOS tumors, when observed under a microscope, have enough elements to be diagnosed as adenocarcinomas, however, not enough to further classify them. They're most common in the minor salivary glands and parotid glands and can be any grade. Rare adenocarcinomas: Various forms of adenocarcinoma are very rare. Some are frequently low grade and generally have a good prognosis. There are other rare adenocarcinomas that are high grade and could have a less favorable prognosis. Almost all of these types of cancer are carcinoma ex pleomorphic adenomas. Carcinoma ex pleomorphic adenoma starts from a pleomorphic adenoma (benign mixed tumor). It develops mostly in the major salivary glands. The stage (how far the cancer has spread) and grade are essential in predicting the outcome. Squamous cell carcinoma: Cancer that usually affects older men. It may develop following radiation treatment for another cancer in that area. It tends to have a poor prognosis. Anaplastic small cell carcinoma: These tumors' cells have nerve cell-like features. They tend to grow quickly and are often found in minor salivary glands. Undifferentiated carcinomas: This is a cancer group that includes large cell undifferentiated carcinoma, small cell undifferentiated carcinoma as well as lymphoepithelial carcinoma. They're high-grade cancers that do tend to spread. They tend not to have a good outlook. Lymphoepithelial carcinoma, more common in Inuit and Eskimo people has a slightly better prognosis. Epithelial-myoepithelial carcinoma: A low grade, rare tumor that sometimes comes back following treatment or spreads to other areas of the body. Other cancers that could impact the salivary glands are usually not considered "genuine salivary gland cancers." This is because they're usually in other areas of the body or they begin in another area and then spread or grow into the salivary glands. Non-Hodgkin Lymphoma: Many of these cancers begin in the lymph nodes. They rarely start in the salivary glands in cells of the immune system. They are treated and behave differently from other salivary gland cancers. Most lymphomas that begin in the salivary glands impact individuals with Sjogren syndrome (a condition that causes your immune system to go after your salivary gland cells and attack them). Secondary Salivary Gland Cancers: Cancers starting elsewhere that spread to your salivary glands are referred to as secondary salivary gland cancers. Treatment for them depends on where they started. Sarcomas: Your salivary glands contain muscle cells, blood vessels and cells that produce connective tissue. Sarcomas are cancers that develop in these types of cells. They don't usually occur in your salivary gland. Exposure to substances in the workplace: Individuals who work with certain substances in the workplace could have a higher risk of salivary gland tumors. Jobs such as plumbing, asbestos mining and rubber manufacturing are linked with salivary gland tumors. Older age: While salivary gland tumors can develop at any age, they often develop in older adults. Radiation exposure: Radiation, like that used for treating neck and head cancers, increases your risk of parotid (salivary gland) tumors. An ear, nose and throat (ENT) doctor or otolaryngologist who treat certain diseases of the neck and head. A medical oncologist who treats patients with medicines like chemotherapy for cancer. A radiation oncologist who treats patients with radiation therapy for cancer. There could be a number of other specialists involved in your treatment plan, including nurse practitioners, physician assistants, speech therapists, nutrition specialists and occupational therapists. The doctor will perform a physical exam, order a CT scan or MRI and get a biopsy (tissue sample) to see if your tumor is benign. If it turns out its cancerous, they'll stage it based on its location and size. Stage I: Tumors are very small (no more than two centimeters across) and don't spread to other areas of your body. Stage II: Tumors are a little bigger (between two and four cm) but remain in the original gland. Stage III: Tumors have spread from the gland, possibly to your lymph nodes located in your neck on the same side. Stage IV: Tumors have definitely spread to your lymph nodes and possibly to other areas of your body. Physicians will also give salivary gland tumors a certain grade of one to three which measures the rate of speed in which the cancer cells grow. Grade 1: This is a low-grade cancer and still has a good chance of being cured. It's slow growing and doesn't look that different than your normal cells. Grade 2: Cancer is growing moderately fast. Grade 3: Cancer is growing quickly. Parotid gland tumor treatment options will depend on the stage, size, type, grade and location of your cancer. The doctor will also take your general health and age into account. The most common treatment for parotid gland cancer is surgery, particularly slower-growing and early-stage cases. It might involve the surgeon taking part of your salivary gland out or the entire thing. They may remove your lymph nodes and possibly perform some reconstructive work on your neck and face. Chemotherapy and radiation aren't the first line treatment for this type of cancer, except in cases more advanced. You may have radiation following surgery to ensure any remaining cancer cells are destroyed. Most salivary gland tumors are slow growing and noncancerous. Eliminating the tumor with surgery will often cure the condition. Sometimes the tumor is cancerous in rare cases and requires treatment. There's no way of preventing salivary gland cancer. But, you can decrease your risk of developing this condition by avoiding certain risk factors such as excessive alcohol consumption and smoking. If you suspect you have a parotid tumor or find yourself "looking for an ENT doctor near me in Houston, Texas," contact Houston ENT & Allergy Services. We provide care to patients in Houston, TX and surrounding areas.